Love 30 wishes all our supporters a happy and safe New Year. Here’s a short review of 2017. We were delighted to see the introduction of widespread 30 km/h speed limits in the Dublin area, which will make these areas safer, quieter and encourage more people to walk and cycle. 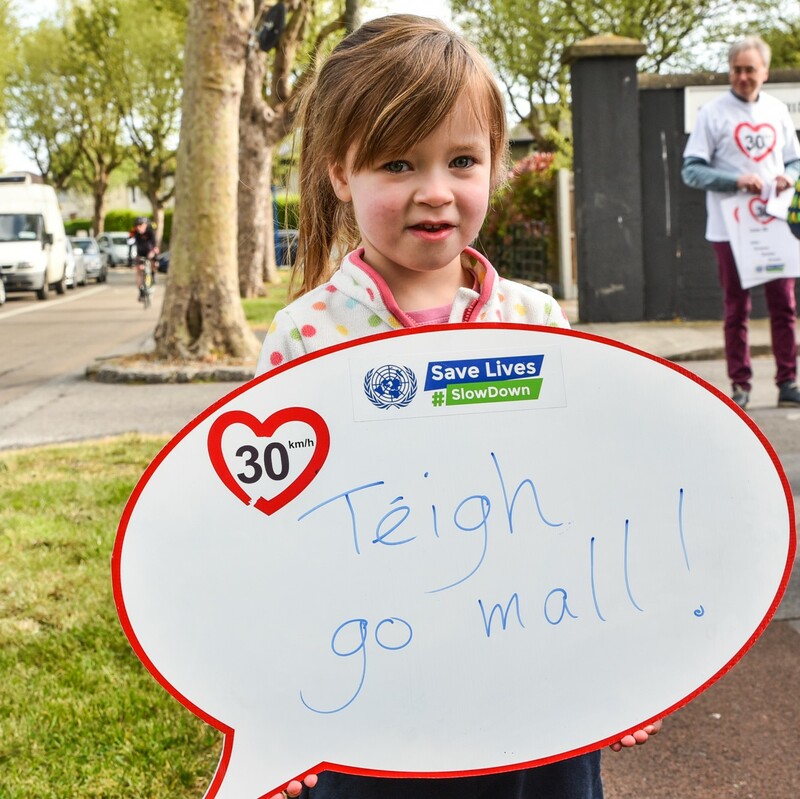 Love 30 made submissions supporting proposals for 30 km/h speed limits in some residential estates in Offaly, Roscommon, Mayo, Cavan, Sligo, Laois, Cork City, Galway City, and Fingal. Speed was the focus of the UN Global Road Safety Week on 8-12 May. Love 30 organised a number of events, centred on a Slow Down Day on 9th May. The RSA Academic Lecture for the launch of Road Safety Week on 2 October was devoted to the introduction of 30 km/h limits in urban areas. Rod King of UK’s 20’s Plenty spoke as did Dermot Stevenson of Dublin City Council. We will continue to campaign for 30 km/h speed limits on residential and urban streets and anywhere people walk and cycle. 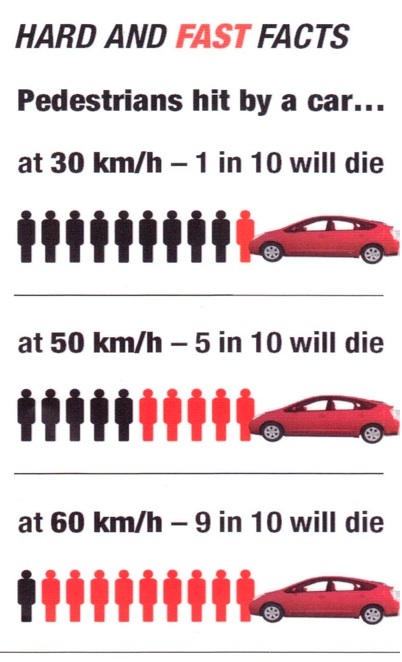 And we will be monitoring the effectiveness of the lower speed limits in the new 30 km/h areas. 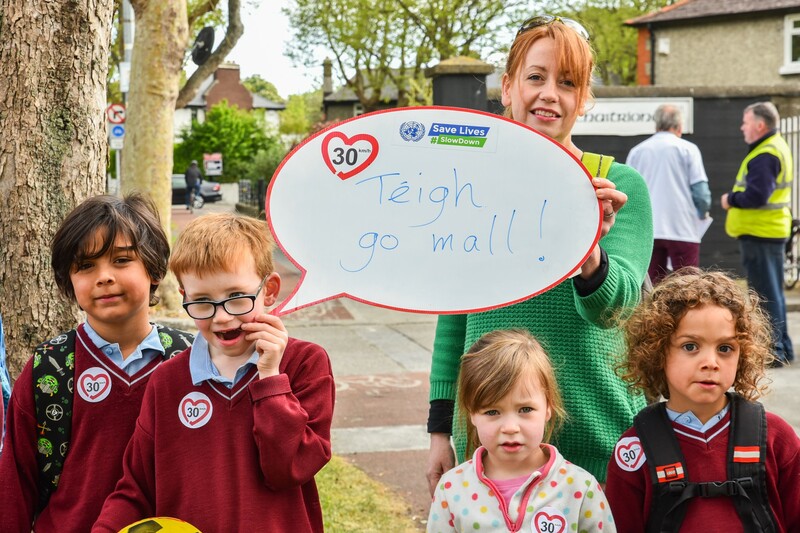 May 2018: This week, we saw support from politicians across the political spectrum for the UN’s Global Road Safety Week, coordinated by campaign group Love 30. 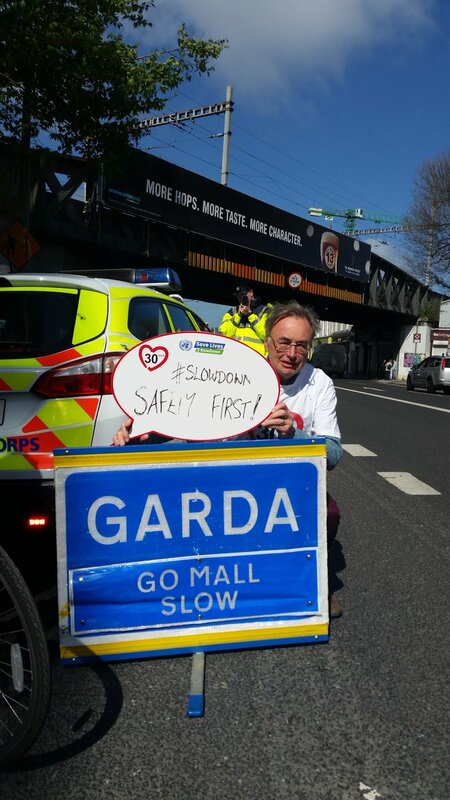 The politicians’ willingness to support the call to ‘Save Lives #SlowDown’ was a welcome gesture; we are hopeful that this core group of supporting TDs (Members of Parliament) and Senators will continue to grow, recognising the needs of local communities and young children to have a safe environment in which to grow up. Throughout the week, we have been asking drivers to take the pledge and act to Save Lives #SlowDown. Together with our Garda Traffic Corps, we are carrying out extra speed checks right through the week in locations where cyclists have reported excessive speeding. Local communities have welcomed this initiative and indicated how happy they are to see these actions being taken to make their neighbourhoods safer. We also got schoolchildren involved, asking pupils from a number of schools on Dublin’s northside to support the pledge to get drivers to slow down. 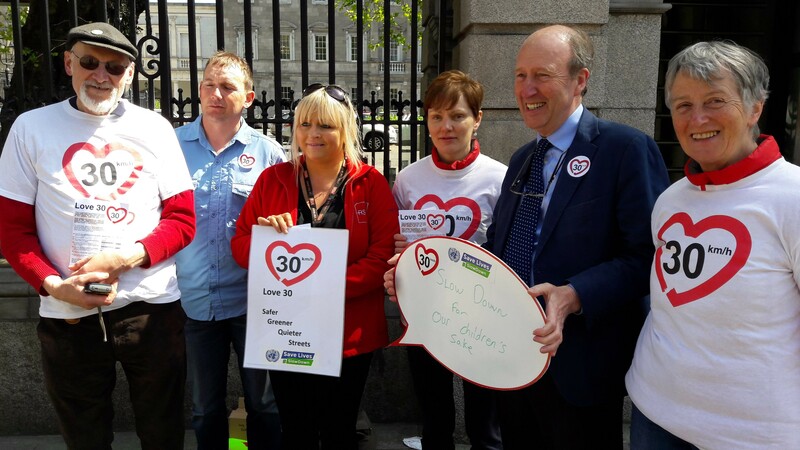 Love 30 (www.love30.ie) is a coalition of cycling, pedestrian, children’s and community groups here in Ireland campaigning for lower speed limits to make our towns and cities safer and more pleasant places to live, work and play. Dublin Cycling Campaign members are active in this coalition. 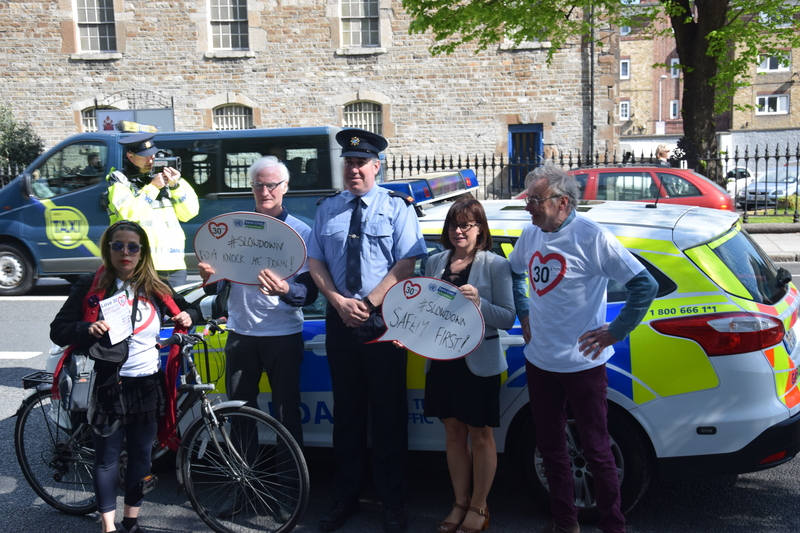 Both Love30 and Dublin Cycling Campaign welcomed the support of the Garda Traffic Corps in highlighting the effects of excessive speed. 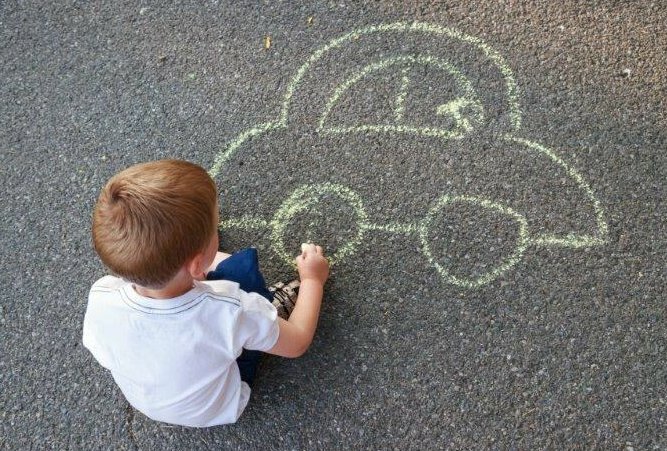 Dublin City has recently introduced widespread 30kph speed limits, and this week’s campaign highlighted the need to remind drivers to protect vulnerable road users, particularly older and younger people, by adhering to posted speed limits. Why not go online now at https://www.unroadsafetyweek.org/en/home and Sign the Pledge to Make a Difference and Save Lives #SlowDown! 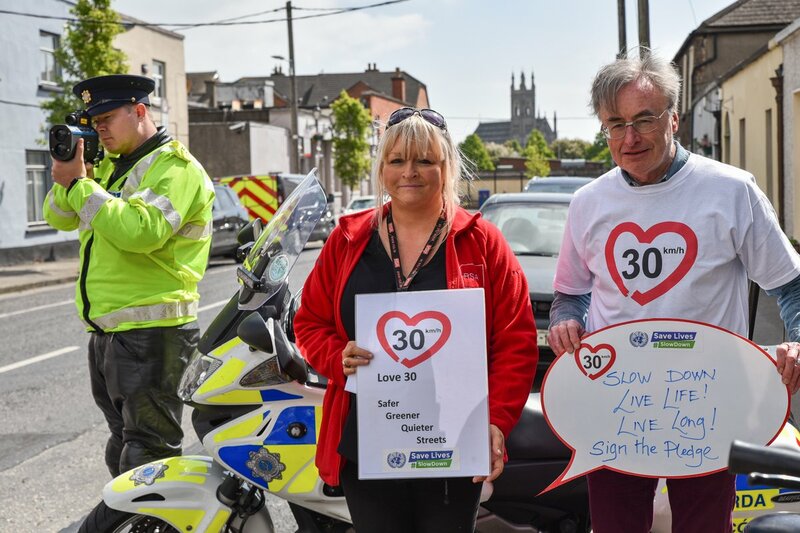 Love 30 held a launch on May 8th of the UN's Global Road Safety Week, bringing together the Road Safety Authority, the Garda Traffic Corps and campaigners to support the UN's call to 'Save Lives #SlowDown'. The Garda Traffic Corps were in attendance. Love 30/ UN Road Safety Week - launch with Road Safety Authority, Garda Traffic Corps, Duncan Stewart and Love 30 team. If you would like to be part of the Love 30 campaign or you would like more information about the campaign, reach us on twitter or facebook and/or by email here.